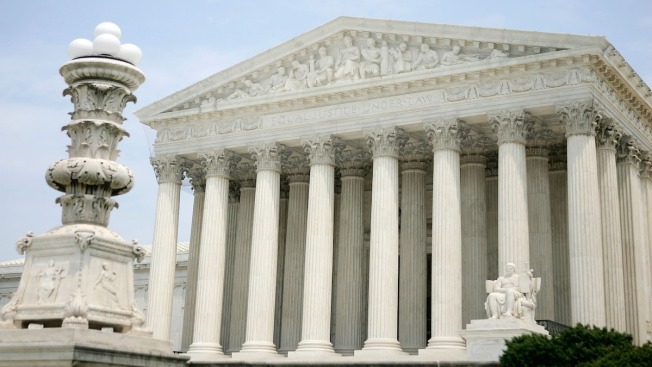 The Supreme Court on Monday appeared ready to deal a major blow to organized labor as it considers the free speech rights of government workers who say they shouldn't be forced to pay fees to public sector unions. The high court's conservative justices seemed inclined during 80 minutes of oral argument to overrule a four-decade old precedent that allows public unions to collect "fair share" fees from non-members to help cover the costs of collective bargaining. A group of California public school teachers claims those mandatory fees violate the First Amendment rights of workers who disagree with the union's positions. Justice Anthony Kennedy rejected arguments made by lawyers for the state of California and the California Teachers Association that the current fee system is needed to prevent non-members from becoming "free riders" who get all the benefits of union bargaining and grievance procedures without paying for it. "The union is basically making the teachers 'compelled-riders' on issues with which they strongly disagree," Kennedy said. Arguing in support of the union, California Solicitor General Edward Dumont said the state needs a reliable bargaining partner that is funded by all the workers it represents. He said the fees for collective bargaining typically apply to non-political issues such as mileage reimbursement, working hours and other mundane issues. But Chief Justice John Roberts said even routine matters can become politically charged if they involve how the state spends money. "That's always a public policy issue," Roberts said. The California teachers want the high court to overturn a 1977 precedent that allows public unions to collect money from non-members to help cover the costs of collective bargaining as long as the money doesn't go to political causes. The court in that case, Abood v. Detroit Board of Education, said the arrangement was justified to prevent non-members from becoming free riders. But the teachers argue that unions have become more political over time. They say even a push for higher salaries and pension benefits raises political questions about the best use of tax dollars for cash-strapped localities. Arguing for the teachers, Michael Carvin said if the current regime is upheld, every public employee in California is essentially subsidizing "the governor's political war chest." Justice Elena Kagan warned that the challengers bear a heavy burden to overturn a nearly 40-year-old case on which thousands of contracts and millions of employees rely. Half the states already have right-to-work laws banning mandatory fees, but most members of public-employee unions are concentrated in states that don't, including California, New York and Illinois. Labor officials fear that union members will leave in droves if they realize they can get all the benefits of representation without paying for it. Union advocates say the lawsuit is part of a conservative agenda to weaken powerful labor unions, known for reliably supporting Democratic candidates and policies. The teachers are backed by the conservative Center for Individual Rights. The unions argue that the First Amendment applies differently to public employees performing their jobs. They assert that the state has a strong interest in promoting efficiency and avoiding costly workplace disruptions by designating the union as the exclusive bargaining representative for workers. For decades, the growth of union workers in government has helped compensate for steep losses in manufacturing, construction and other private industries where unions once thrived. About half of all union members are now in the public sector, which has a membership rate of 36 percent. That's more than five times higher than that of the private sector, at 6.6 percent.